Yes, that’s not a typo. This article should have been published 10 years ago. It’s about DHTML, and apparently Netscape 4.7. 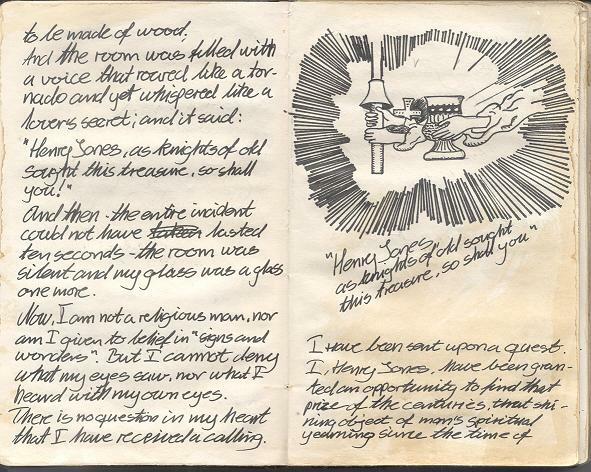 Today, I was cleaning my office and found an old journal that I had created in the summer of 2000. It was a set of specific workaround for the different browsers at the time, like Internet Explorer 4 and Netscape Navigator 4.7. 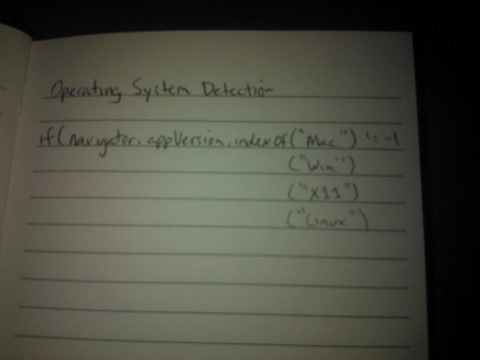 Browser compatibility was so bad that I actually kept a journal of all of the workarounds I had discovered. 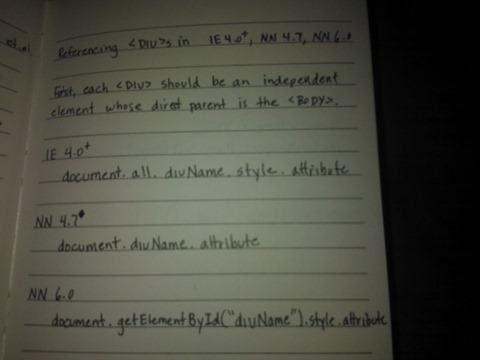 First, each <DIV> should be an independent element whose direct parent is the <BODY>. 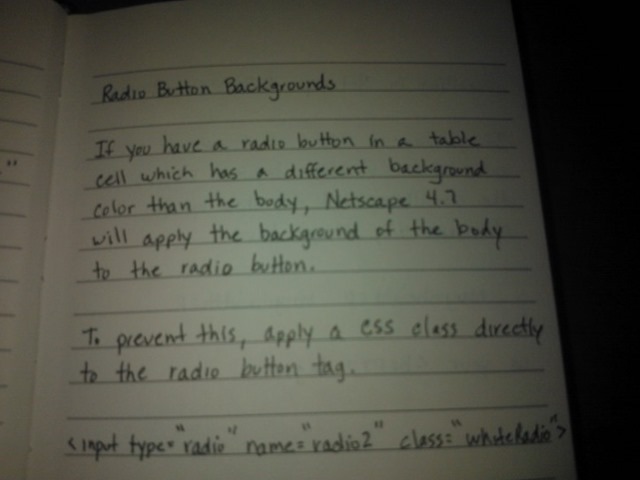 If you have a radio button in a table cell which has a different background color than the <body>, Netscape 4.7 will apply the background color of the body to the radio button. To prevent this, apply a CSS class directly to the radio button tag. 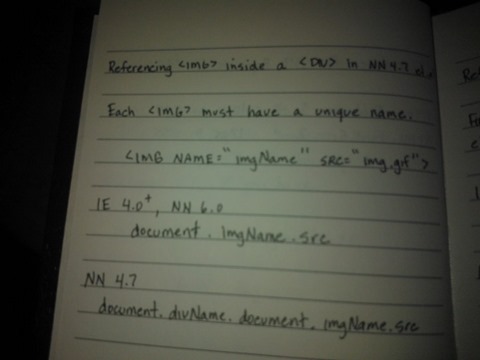 Referencing <IMG> inside a <DIV> in NN 4.7 et. al. Each <IMG> must have a unique name. Netscape 4.7 does not allow this. 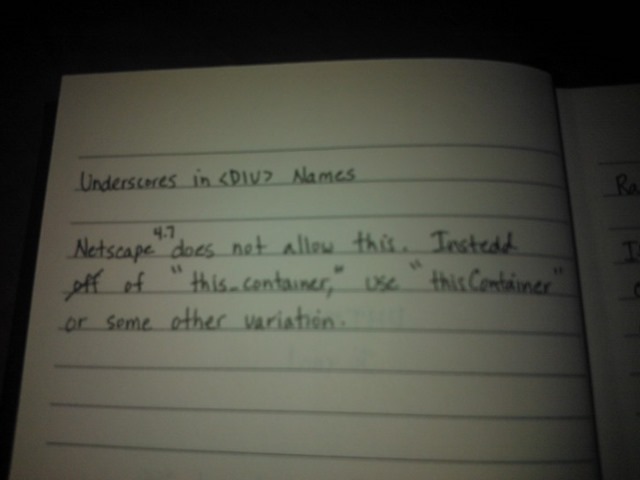 Instead of “this_container,” use “thisContainer” or some other variation. I recall having aspirations of putting a published book together with all of these tips. Here’s a few observations I made about ME as a developer 12 years ago. 1) I had absolutely no business being employed as a software developer. 2) Browser compatibility, for all we complain about it, is nowhere near as bad as it was. 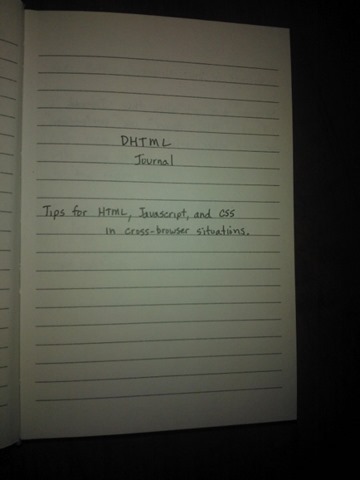 3) Apparently, I capitalized all of the tags and their property names in HTML. 5) I remember treating this book like Henry Jones Sr. treated his grail diary. It held all of the secrets to unlocking the power of the web. Do you have any silly old stuff like this laying around? I’d love to hear your stories about old development practices you employed. This entry was posted in Discussions, Web. Bookmark the permalink. Nice 🙂 I remember the times when we had to choose between layer in NN4 and div in IE, when animated gifs were supported only in some browsers (that’s around 1996 and Netscape Navigator Gold was the hot stuff of the day :).. 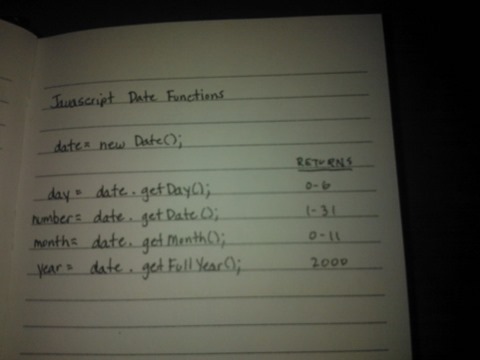 Anyway, why did you use a notebook instead of a text file?